Start your space-saving desk at the top. Our compact desktops come in GREENGUARD laminate, 1" thick bamboo, and reclaimed wood styles! Free up 6" of depth or width. Sit-stand desks that are 24" deep or 42" wide give you many health benefits, even without large spaces. Choose a 1" thick premium Bamboo desktop, or upgrade to a wood desktop made from 100% real reclaimed Douglas Fir. Or, choose our Eco UV-cured powder-coated desktop, made of 100% recycled wood composite, in your pick of black or white. UPLIFT space saver desktops are available in 24" and 30" depths and a variety of different widths: 42", 60", and 72". Choose the size that will best fit your limited space. If you're looking for a full-size standing desk, browse our entire selection by clicking here. In an era of limited space and growing businesses, sometimes you need a desk that you can fit anywhere. That's where the UPLIFT Space Saver Standing Desk is an ideal addition to any office or workspace. Savor your newfound freedom of movement to sit and stand at this compact yet fully functional workstation. This desk fits in offices with more demanding space restrictions, including squeezing into compact spaces as small as 24" deep. The Space Saver Standing Desk features smaller desktop and desk frame components, giving you a condensed workstation that still allows you a full 25.6" of height adjustments thanks to its whisper quiet dual-motor electric frame. Give yourself the gift of movement at work with one work-altering desk addition. Accessorize your desk with UPLIFT's many ergo-friendly desk tools, such as mountable keyboard trays, CPU holders, and half circle drawers to get you working more ergonomically in no time. It's the modest yet complete desk setup to bring your work to more comfortable levels quickly and easily. What makes a desk a "space saver"? Our Space Saver Desks are for tighter spaces. All desktops offered here are 24" deep and less than 48" wide. These are great desks when space is limited or if you have a tight budget. If I want to upgrade to a larger desktop later, can I use the same frame? You sure can! UPLIFT Desk frames are modular, so most of the parts are the same on desktops of all sizes. To upgrade to a larger top you'd likely just need the full size crossbars and crossbar ends. When the time comes, our Sales Pros can help make sure you have all of the parts your need to support a larger desktop. Do you have any 24" depth desktops? Yes, the Eco finish, bamboo, or reclaimed wood desktops are offered in the 24" depth. Can I get a desk that is narrower than 24" in depth. The narrowest desktops we keep in stock are 24" deep. We can custom cut laminate and solid wood desktops to your exact specifications, but the side brackets on each side of the UPLIFT desk frame are just under 22". You would not be able to install the UPLIFT Desk frame on a desktop narrower than 22" deep. 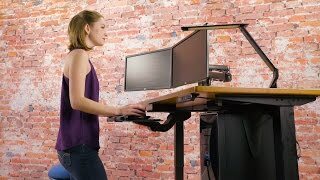 Why aren't these sizes also listed with the standard desks? To help streamline the selection process, we have split off the more specialty tops from the standard listings. That way the choices aren't overwhelming for those looking for a simpler setup. Why use the Space Saver over a small version of a standard desk? The Space Saver Desktops are 24" deep as opposed to the standard 30" deep. They're great for work areas with limited space where a smaller footprint is necessary. What if I need a size that isn't listed here? If you need a shallow desktop in a size that isn't listed here, we can custom make you a laminate or solid wood desktop. Call, chat, or email our Sales Team for a price quote. Do the feet of the desk stick out past the top? No, our Space Saver Desks come with a set of narrow feet so that they won't stick out past the edge of the desktop. Why do you not offer the full line-up of accessories with the Space Saver Desk? Due to the small amount of under desk space, some accessories are unavailable. Do you offer a desk that is smaller than 42" W x 24" D? No, at this time we do not offer a smaller desktop. Besides the shorter depth of the desktop, are there any differences between the Space Saver and the regular UPLIFT desk? The bracket that attaches to the desktop is the same size, but the feet on the Space Saver desk are shorter so that they do not stick out past the edge of the desktop. Since the UPLIFT Space Saver desktop is not as deep, it does not need as large of a base to make it stable. Otherwise, you will get the same great three-stage frame as offered with the other UPLIFT desks. Will the keyboard tray fit on the Space Saver desk? Yes! We recommend adding a keyboard tray so that you can take full advantage of the limited amount of space that you have on your desktop. Am I compromising on anything besides desktop space by getting a Space Saver Desk? No, you will get the same great UPLIFT Desk frame, just with shorter feet. Ordering the Space Saver Desk is not a compromise on the UPLIFT Desk quality, it is just a great solution for tight fits. Will this desk work with my outlets and voltage if I live outside of the Unites States? All UPLIFT Desks are made to run on the US electricity standard of 120 volts. If you purchase an UPLIFT Desk from outside the United States, with the exception of Canada, you'll need to plug your desk into a step down transformer first, otherwise you run the risk of overloading your desk's control box, which is not covered by warranty. Please reach out to our support team if you have any questions. How loud is the desk motor? The UPLIFT desk motor is 45 decibels quiet. The sound falls somewhere between the sound of your computer and your refrigerator. And that is only while it is raising or lowering! How easy is the Space Saver Desk to assemble? Super easy! Check out our assembly video to see exactly how easy it will be to assemble your desk. Are these the same finishes as found on your other desktop listings? Yes, the Eco finish, bamboo, or reclaimed wood desktops are the same finishes as offered on the other desktop builders. The quality of the material is the same, the only difference being the shorter depth. Take a peek at the silver label on you control box - if that sticker says v4.1, v4.2, or v4.3, you have the newest version of UPLIFT Desk's control box, which comes with a few exciting, new features! You'll love UPLIFT Desk's version 4 control boxes because they come with new safety features: Keypad Lockout and Collision Sensitivity. The Collision Sensitivity feature allows users to set the sensitivity for their desks to one of three levels, so when adjusting for height, the desk stops when it touches an object instead of continuing to go up or down, which can knock things over and cause accidents. Keypad Lockout lets you keep unwanted hands from adjusting your sit-stand desk when the feature is activated. And users will now be able to switch quickly between One-Touch and Constant-Touch modes, in addition to being able to toggle between inches and centimeters. All of these features combine to make for one very smart desk. Is this a two-stage or three-stage frame? UPLIFT Desk frames are three-stage vs the traditional two-stage desk on the market today, which means these desks are 33% faster thanks to using 3 spindles in the legs instead of 2. This means you have a higher adjustability range so desks fit shorter users, kids, and tall users! What is this "dual-motor design" I keep hearing about? Every UPLIFT Desk comes with a dual-motor design, so each leg gets its own motor. This makes UPLIFT Desks quieter to adjust, stronger and more reliable, and safer than desks with just a single motor. When building your dream desk, pay attention to the little details that make UPLIFT Desks stand out above the rest. $554.00 List Price: $754.00* The list price is the same as the MSRP (Manufacturer's Suggested Retail Price). It may not necessarily be the price at which the product is sold. 60x24 > 60" x 24"